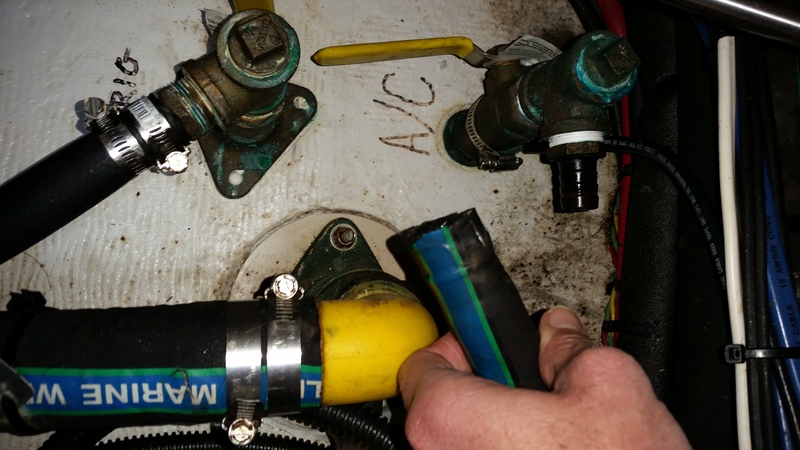 This will probably be boring to our friends and family but for any boat owners out there who need a bit of guidance on how to flush a blockage out of their AC/heating system this may be helpful. Having central AC and heat is not something I expect I will be concerned about when we head south, but right now, with temps already dipping down to freezing, it’s a creature comfort I’d rather not do without, so we were eager to figure out why our system wasn’t working. It became an easy diagnosis when John-Michael realized water was not flowing through. Our haul-out made it very clear how encrusted the hull was with barnacles. It made sense that some of that growth made it into the pump. Now we just had to figure out how to flush it out. First, John-Michael closed the intake and discharge valves and disconnected the hoses attached. 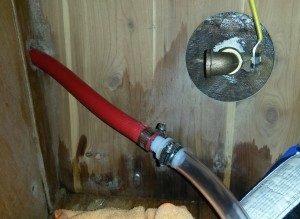 We also cleaned the AC system raw water filter, which was dirty, but not so much that it was the cause of the blockage. 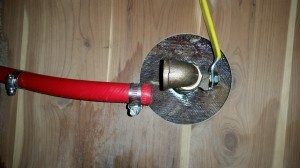 He measured the hose diameters and purchased two lengths of tubing and connectors to fit, making sure he had more than enough tubing to span the distance from each valve to a 5-gallon bucket. A few hose clamps sealed them off perfectly. 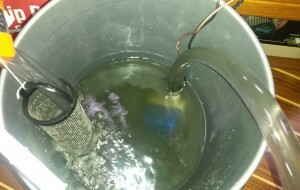 We poured the Barnacle Buster into the bucket, using about half the bottle and 2 gallons of water. Then we turned on the AC. Nothing. The pump was turning, but no liquid was flowing. 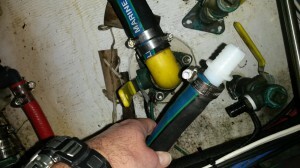 Realizing the pump was too blocked to cycle the Barnacle Buster through it, we had to come up with a new plan. Luckily, we had a spare bilge pump. John-Michael placed the bilge pump in the bucket filled with Barnacle Buster and connected the out flow of the pump to the intake side of the AC system just before the raw water filter. He then connected the bilge pump’s wires to a battery and VOILA! Right away the AC started to flow, and out came the funk that was blocking the pump. We let it run for another hour to make sure it was completely clean. After putting everything back together we had a very comfortable night onboard. Next – the engine gets its own flush!